Our special offering for September supports the Opportunity Services Center, our local center of InnVision Shelter Network, which addresses the needs of the homeless in our area. The Opportunity Services Center is located at 33 Encina Avenue in Palo Alto, between Town and Country Village and the Palo Alto Medical Foundation. It functions as a service to the wider community by providing a creative response to homeless-related problems and offering opportunities for the community to respond to those needs. Its highest concern is to provide a positive and caring environment that respects the dignity of every person. The Opportunity Center itself has 88 units of housing for both single adults and families. It provides a wide variety of services to assist with basic needs and to enable people to find stability in their lives and housing. The first step towards helping community members find their way out of homelessness, or to help them avoid it, is to provide for their basic needs, such as a hot cup of coffee, somewhere to perform personal hygiene, a place to pick up mail or return a phone call, assistance in finding food and shelter, and a supportive sense of community. Once they’re in the door with some basic needs met, people need access to a wide variety of social, rehabilitative, and educational services. The Opportunity Center is a place that is organized and set up to address a wide range of those needs that go beyond the basics. This September offering gives us the opportunity to impact those in need right here at home. Our goal for this offering is $600. Please give generously to help meet this goal. September’s Special Mission Offering is for InnVision and the Opportunity Services Center. The center functions as a service to the wider community by providing a creative response to home-less related problems and offering opportunities for the community to respond to those needs. Its highest concern is to provide a positive and caring environment that respects the dignity of every person. To date we have received $490 toward our goal of $600. To date we have received $340 toward our goal of $600. September’s Special Mission Offering will be for Opportunity Services Center of Palo Alto and InnVision Shelter Network. Our special offering for September supports the Opportunity Services Center, our local center of Invision/Shelter Network, which addresses the needs of the homeless in our area. 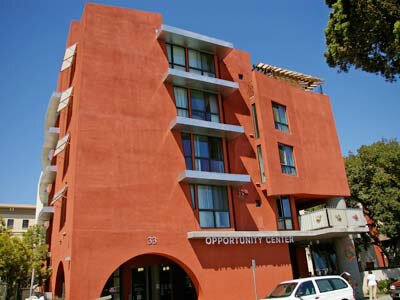 The Opportunity Services Center, located at 33 Encina Avenue in Palo Alto, functions as a service to the wider community by providing a creative response to home-less related problems and offering opportunities for the community to respond to those needs. Its highest concern is to provide a positive and caring environment that respects the dignity of every person. This September offering gives us the opportunity to impact those in need right here at home. Please give generously to help meet this goal. To date we have received $610 toward our goal of $600. Congratulations!